In this tutorial I’ll try to show how I use City designer 3 and Photoshop CS5 to make my city maps. Hopefully you as a reader can learn a thing or two, but be warned this is how I work. That means that there might be more effective and quicker ways to reach the same reslut. If you miss some information or if I’m just impossible to understand please let me know in the comments and I try to clarify. To complete this tutorial you need a copy of Photoshop CS4 or CS5. The reason earlier versions wont work is that you need a litle free addon from Adobe called pixelbender. And it only works on the newer versions. 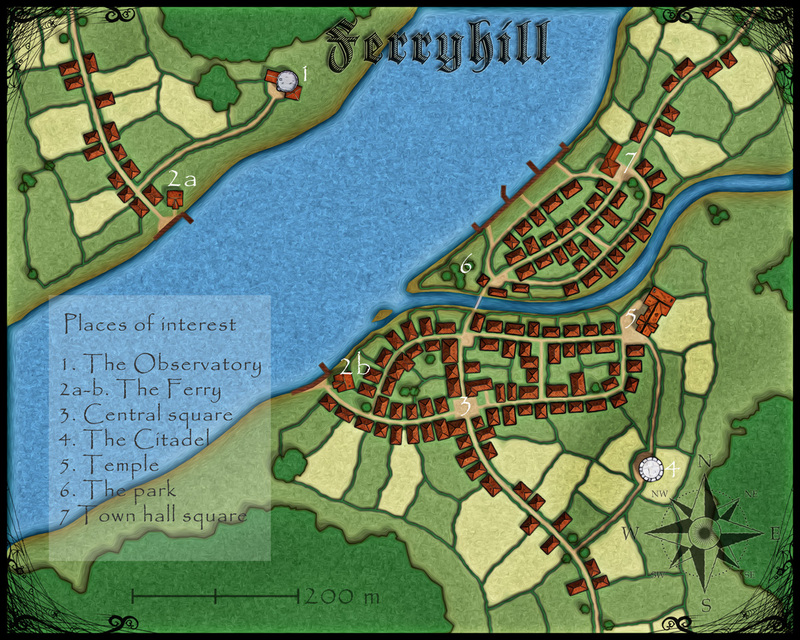 You also need a version of City Designer 3 from Profantasy, which also means that you need a copy of campaign Cartographer 3. When I make maps I usually try to make a story around the map. This makes it easier, at least for me, to get some inspiration when you work. It also makes it easier to come up with ideas of what to put into your map. For this particular map I’ve decided to make a map of the small town Oddwood in the northern parts of the kingdom Armadien. 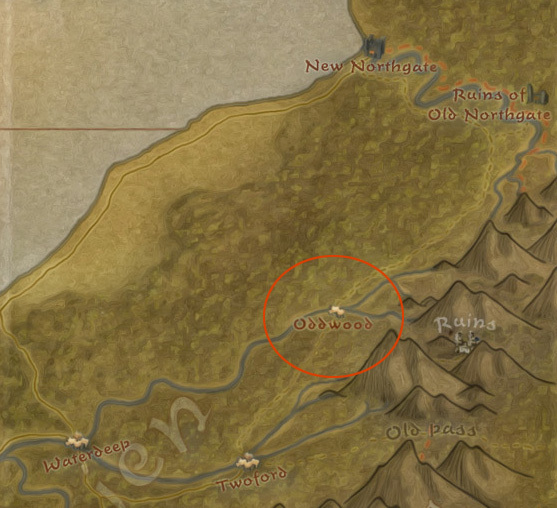 Oddwood is a small town situated on the road to the northern part of the kingdom. To the east you have some old ruins from the time before the old apocalypse. This means that a lot of adventurers and treasure seekers pass by here. To the north you have smaller villages and the wild barbarian woods, home to dangerous savages and mythical creatures. 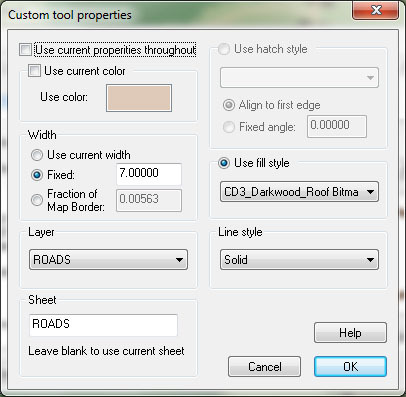 First of all you need to start a new map in City Designer 3/Campaign Cartographer 3. Choose city and city style A. I’m using the default settings here except for the size that I’m slightly increasing. The size you’re using depends on how big you want to make your town. It’s not much but it is a start. When you’ve come this far you have to start to think about where your town exactly will be situated. Try to take the river, or other water constellation you have created, into account when you decide this. When you have a fairly good idea of how you want it to be start to draw some roads that will lead into the town. In my map I need a road that goes from south to north. 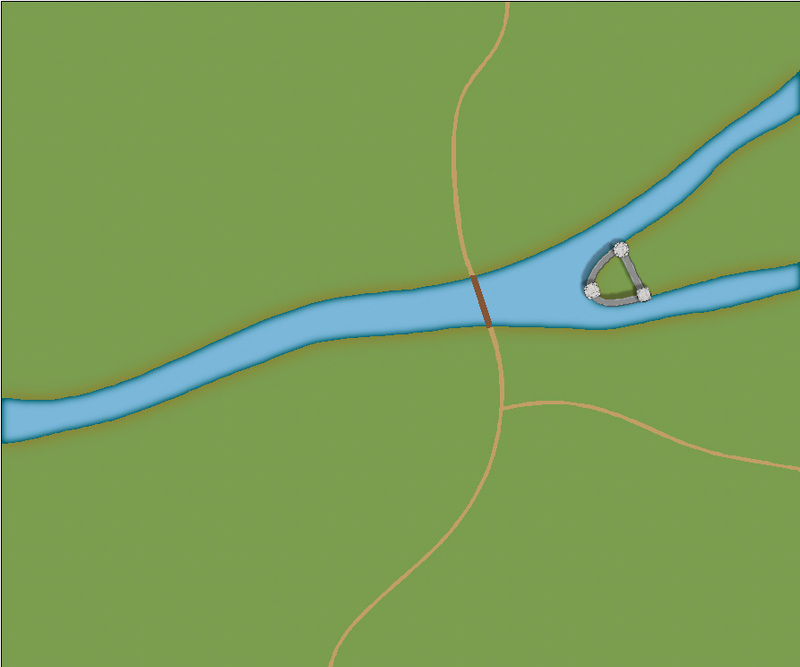 I also need a bridge over the river and a road to the eastern ruins. Apart from this I’m putting in a fortress where the rivers meet. This feels like an strategically important place that the rest of the town will be build around. To make the fortress I used the buildings from style B, not A. I prefer the city style B buildings because they look more hand made then style A. You decide what you like. Well that is all for this time. Next time I will start to layout the town. 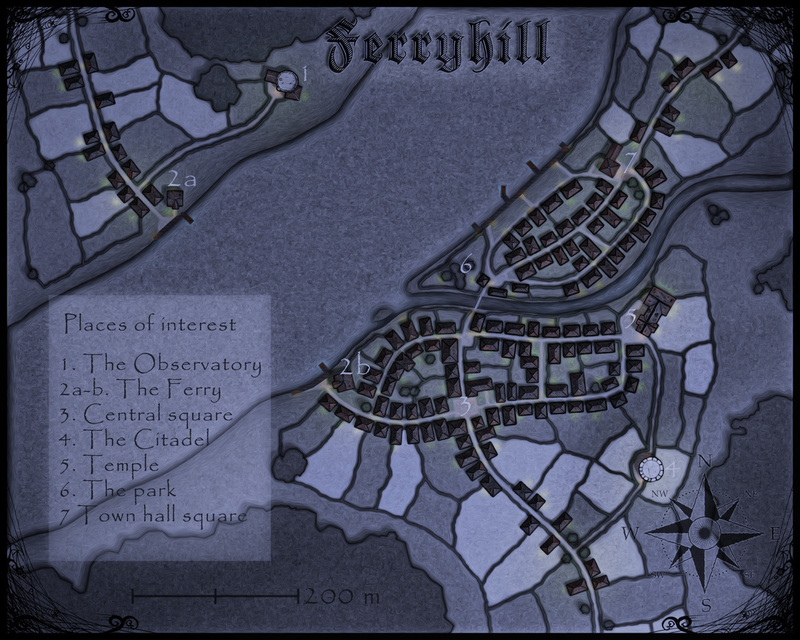 This was a bit of an experiment trying to make a night version of my Ferryhill map. What I mainly did was to duplicate the image and make the top one black and white. There are a couple of ways to do this, I usually do it by applying a gradient map layer that goes from black to white and then merge the top layer with the gradient map layer. The gradient map layer makes the contrast really nice and I like that. I then added a layer mask to the top layer (the black and white version of the picture) selected the pen and changed the opacity of the pen to around 30-40%. The size of the pen depends on the size of your picture. I then started to paint in the layer mask with black. This will make the parts where you paint invisible, which means that the colour version shines through and look like lights in the night. When you’re satisfied with the lights you’re painting in add a new layer mask layer called photo Filter. Choose filter Blue and change the opacity of the layer to around 60%. This will make the night look a bit more bluish, which I like. If you like to have the night blacker, don’t add this layer. In an earlier post I presented my Etrakien map that I made after having joined Cartographers guild. As time went by the story of the world had a tendency to outgrow the map in many ways. So I decided to start all over again and make a new one. Mainly I wanted to expand the world a bit. A big part of the world’s back story is how the two Empires Arnoria and the Etrakien Empire slowly conquered the world until their borders met and the Great War of Tears broke out, a war that in the end brought them both to their near destruction. To make this development plausible I felt that in the old map the Island of Arnor and the central parts of Etrakien was a bit too close, to solve this I needed to expand the area called the Etrakien sea. A part from that I also wanted the western continent to be bigger. During the war a lot of people emigrated to this western continent to avoid the horrors that war brings with it. I see this western continent a bit like when America was colonized. There are great plains where small communities have settled in and the state don’t have the same control of its citizens and land here as in the “old” part of the world. Life is in many ways hard and there are foreign creatures and savages to defend against. But at least they are more free then before. The eastern continent was mainly put in to balance the map. Then I just had to put in some countries as well to justify its existence. To expand the world I started with my original map as a base and then started to draw on top of that in a new layer in Photoshop. In the picture below you can see the progress. This was an easy way to keep the feeling and look from the original map. The western continent is actually partly based on the two bigger western islands but moved to the left. You can clearly see how far I moved them if you look at the island Perlago (marked out with a red circle on the map) that is situated between the two continents. I’ve imagined the Etrakien world to be the same size as earth. So when I made the map I downloaded a map of earth that I put in a bottom layer in photoshop. This was an easy way to get the right proportions in the map. I also used earth as inspiration when I created the eastern continent. As you can see in the picture below I “stole” the coast of china and Vietnam :). The whole map kind of slightly resembles earth, which is done by purpose. I believe that this makes the map more convincing because you recognize part of it and will then accept the “wrong” parts more easily. After having done the whole map I had a black and white map that only included mountains. In this map I also put in the regions where civilizations had emerged. I used this map as the base for the new Etrakien map. In this way I could easily transfer the continents onto a paper background and then start painting it from there. The map was completely done in photoshop and all the symbols where made by me, except the compass that I got from the Cartographers guilds homepage. It’s been a while since last time I made a map. But lately I had some free time and decided to make a small village/town map. So this is Ferryhill. 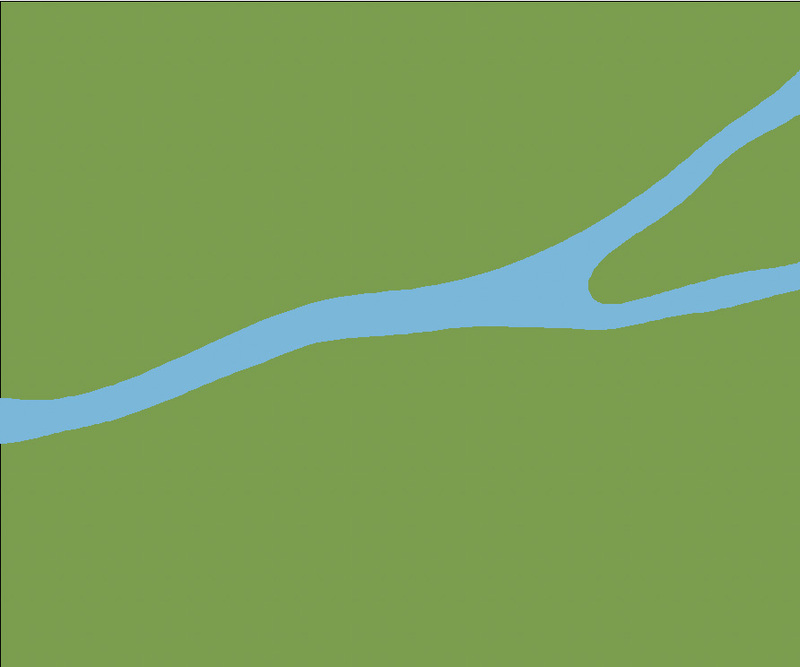 A small town divided by a large river. The only way to pass the river is to use the ferry, from which the town has got its name. The east side of the river is where the main town is situated, on the western side you have some farms and an observatory. The town is mainly made in City Designer 3 (CD3) from Pro fantasy and finished in Photoshop. CD3 is a great tool when you want to create a small to medium sized village/town. The drawback is that you’re using predefined styles, this makes it hard to create something with an individual touch, if you only use CD3. That is the reason why I always finish my maps in Photoshop. In this way I can give them a bit more of a unique look. After having joined the Cartographer’s guild I started on a new version of the Etrakien world. There are probably one or two versions between this version and the one in an earlier post. But they are probably lying forgotten somewhere in a drawer or a box with old stuff on the attic. Making this map was a big struggle for me. Before this I hadn’t done a complete map in Photoshop so I really had to work things out with trial and error while working. I soon realized that there are some shortcuts you can take and some you can’t. The mountains for example I tried to do with a pattern in the beginning but I couldn’t make it look any good, I soon realized that patterns where great for some types of terrain and mountains wasn’t one of these. In the end I actually hand draw all of the mountains, I’m still very pleased with the result but I guess that I probably spent nearly half of the total time on the map to finish them. Another thing I had big problems with was the borders. I think I tried nearly ten different ways of showing the countries on the map. In the end I decided to visualize the countries in different colours, and I think that the end result fits well into the map. The whole process of learning while working was very time consuming and without all the support I got on my work of process thread at the Cartographer’s guild, the end result never would have been as good as it in the end turned out to be. After having finished the map I was also honoured to have the map as a featured map on the Cartographer’s guild homepage, and the nice guys over at Profantasy decided to make a style out of it for their Campaign Cartographer 3 program. 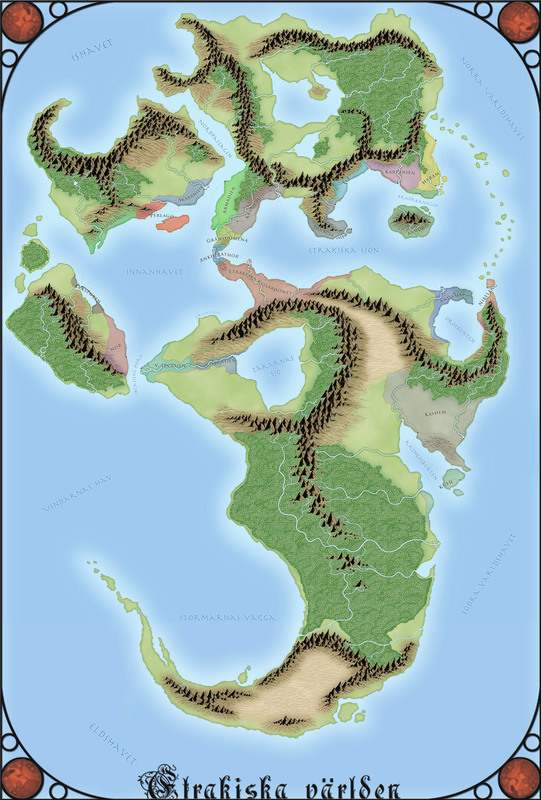 So if you want to make a map in the same style just head over to their homepage and have a look at the Annual 2009’s Fantasy Worlds style. In the end I actually printed the map on a canvas frame, so now I have it on display in my workroom. And I don’t think anyone of my friends understands how much time I’ve put into it and if they did they’d probably think I’m crazy.